uuid : 1d6f6295-7d6c-4b4c-8065-136213deec04 templates_id: 119517 templates_uuid: "781c7982-6a98-4f44-abbc-6c2cc22c9381" title: "Declaration of trust beneficial interest - Deed of Trust" display_name: "Declaration of trust beneficial interest" description: "
Make certain all formal details are in order when the legal owners of the property are not the only owners with this declaration of trust. This deed of trust is necessary where for example Mum and Dad are putting up some of the capital for the purchase price of the property. It covers numerous scenarios where the beneficiaries may or may not also live at the property as well as where the required agreement is simple and only concerns the contribution to the purchase price. where the beneficiary is intending to live at the property and there is a mortgage. They will not be protected if the property owner fails to pay the mortgage and the property is repossessed. 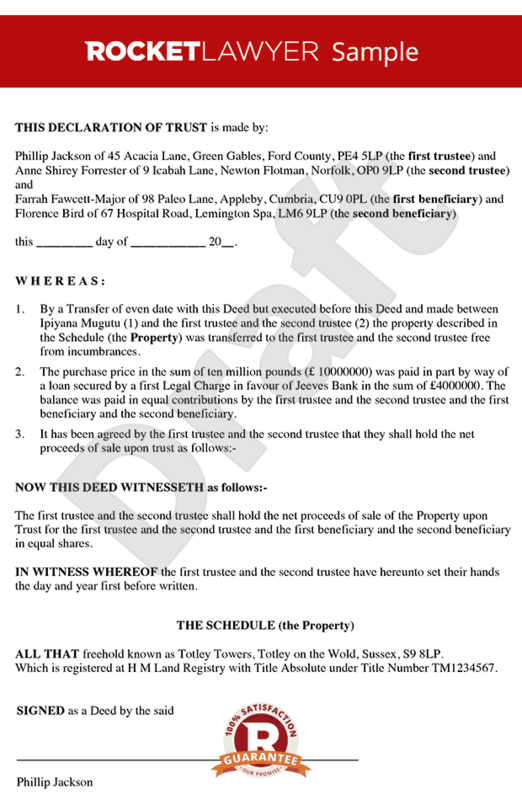 This deed of trust is governed by the law of England and Wales. \r\n" created_timestamp: "2018-10-08 04:36:35.0" modified_timestamp: "2018-10-08 04:36:35.0" active: true created_by: 102 modified_by: 102 dcm_id: 334 url_slug: "Declaration-of-trust-beneficial-interest" meta_description: "Draft a declaration of trust for your property with simple guidance from Rocket Lawyer. Use this template when the legal owners of the property, \'the trustees\', are not the only owners. Try this deed of trust for free." time_to_complete: "15 minutes"
More than just a Declaration of trust beneficial interest template, our step-by-step interview and guidance makes it easy to create your document. Easily create online, download, print and sign your free Declaration of trust beneficial interest in minutes.